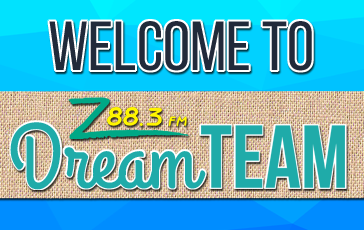 Welcome to our Dream Team page! That’s what we call our volunteers…whether you are helping out at events, fundraiser or here in the studios, we consider you to be our Dream Team. Your Z can’t say thank you enough because we know how valuable your time is. That’s why we’ve made it our mission to find ways to reward and bless our Dream Teamers. If you are new, we just ask that you click on the new volunteer button below and fill out an application. Once received, you’ll be invited to an orientation party to help out at events. If you only want to volunteer for fundraiser and skip the orientation, please just select the fundraiser preference on the application. If you are already one of our awesome Dream Teamers who have already filled out the new application and received a login through email, please click on the existing volunteers button below to login to your profile page. Looking forward to getting to know our newbies. We know our current volunteers can vouch for just how much fun we all have serving together on Dream Team!